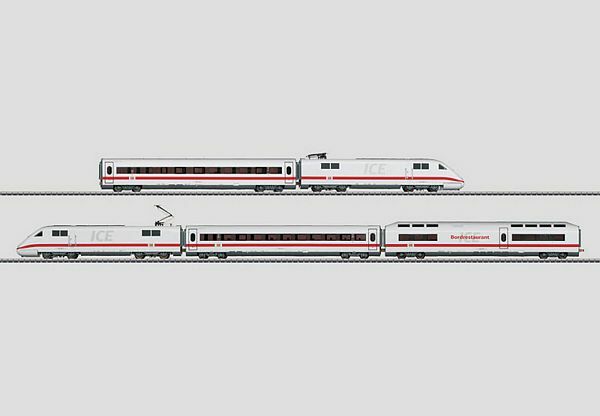 Prototype: German Railroad, Inc. (DB AG) class 401 ICE 1 InterCityExpress high speed train. The train looks as it currently does in real life. Model: This is a five car version. The train has an mfx digital decoder, high efficiency propulsion, and extensive sound functions. 2 axles powered. Traction tires. The train has factory-installed interior lighting. The headlights and the interior lighting are maintenance-free warm white LEDs. The frames for the powered end cars are constructed of metal. The headlights and the interior lighting will work in conventional operation, and can be controlled digitally. Train length 123,5 cm / 48-3/5. 20 Years of the ICE. The 37702 basic set can be expanded to an 8 car train with the 43704 add-on car set.